At first it seemed that Nokia 6230 is different from Nokia 6220 only by few minor features, and you can’t call this phone “brand new”. But presence of MMC card support makes this model extremely interesting. It’s the first of this kind. You can blame me for naming this phone the first, and saying that it was Siemens SL45i, who had the MMC slot first. This sure is true, but this model was more innovative, one of a kind, and didn’t pass further evolution stages. Right now I’m talking about Nokia 6230 being the first of its class phones to have such feature, however, more phones from Nokia and other developers will follow in near future. MMC slot opens new opportunities for the phone, Mp3 player for example. Let’s try to review what new this model actually brings? Handset is powered by 40th platform, that’s why it has typical sizes for its class – 103 x 44 x 20mm, with 97 grams weight. It’s possible to say that the phone fits for most of the consumers, they can carry it wherever they like. Black glossy plastic is used for front panel, while the back of the phone is covered in mat white. The phone looks luxurious, Nokia made the correct decision and placed it into classical series, this is classics for sure. 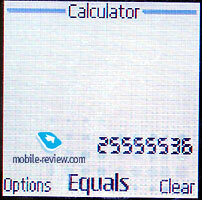 TFT display can show up to 65000 colors. On the whole the screen is a bit worse than Korean analogues, it becomes pale when hitting direct sunlight, but not as pale as previous models were. Screen’s resolution is 128x128 pixels (32x32mm), this allows 5 text lines to be displayed, plus an extra line for service needs. The keyboard is made of plastic, it has average size, buttons stick close to each other. In my opinion, this phone has the nice comfortable keyboard. Keypad backlight is white, such color blending prettifies the phone. Pop-port and charging port are located on the bottom. 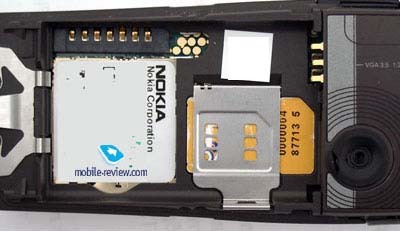 MMC-card slot is placed under the battery, once again Nokia decided to use this system. You have to turn off the phone first, in order to exchange your MMC card with music. Not really comfortable, if you ask me. In my opinion, it is one of the main weakness of this device. Â òåëåôîíå ïðèìåíèëè íîâûé òèï êîíñòðóêöèè SIM-äåðæàòåëÿ, îí îòêèäûâàåòñÿ, ïðè ýòîì äåðæàòåëü êðåïèòñÿ ê êîðïóñó. 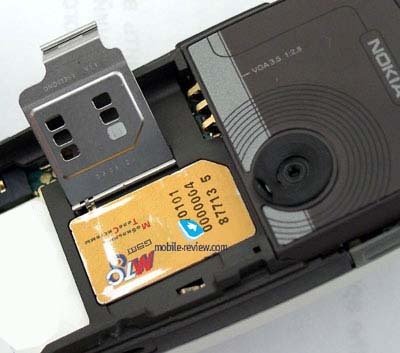 Nokia applies a new construction of SIM-card holder. It is fixed to the case but could be hinged on. Li-on 720 mAh battery is shipped with the handset. Nokia claims that the phone will work up to 200 hours in stand by mode, and 4 hours during the actual talk. While we were testing the phone, it worked for 3 days with 20 minutes spent for talks daily. It takes about 2 hours for phone to charge up. Joystick has lead to a new sign appearing on the screen during the stand by mode – Menu, it’s located in the center of the screen. 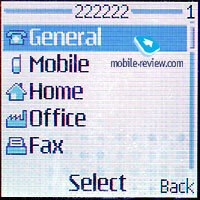 The left and right soft-keys are used for the Go to and Phone book, but left key can be changed to any other function. You can access the Phone book, Organizer and Messages with the help of the Joystick by pressing it in the direction you need. You can’t however assign other functions to the joystick which is disappointing. After we press the joystick – we get to the Main Menu. 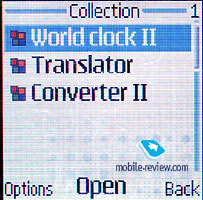 Traditionally to Nokia it’s presented as a vertical list of items. Second variant, 9 icons formed into 3 rows, you can choose between these two types. Nokia 6230 has 6 Mb of memory available for use, it spreads dynamically. Such small amount of memory can be easily explained, 6230 has MMC slot for MMC cards, so, there is no extra need in internal memory. Phone book and Messages have separate fixed memory pool. This means that they do not take a single byte from Java applications, they use own memory. This is a temporary solution, because current one makes the memory semi-dynamical. Anyway, MMC card saves the day. 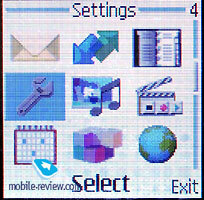 An interface of the phone has been updated, new icon set and some other minor changes were added. Phone book. 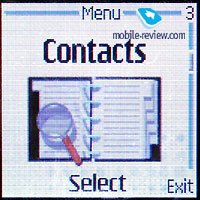 The Phone book’s features are similar to the Nokia 6610 and 6100 etc. Up to 3 numbers and one text field can be added for each entry. As mentioned above, the memory is divided dynamically, this means that if you have less than 300 numbers, you’ll be able to save to about 4-5 numbers and 4 text fields for each contact. Groups are present. You can make 25 voice dials, it works well. Finally you can attach a picture or an image to a contact. In order to do it – you must have a picture made in portrait mode, otherwise – the picture will get scaled to the right size and moved to definite folder. The original will remain untouched. 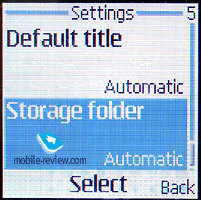 Both the SIM and the Phone’s memory can be viewed simultaneously, with functions for copying entries from SIM to Memory and vice versa. Messages. The Phone can store and send joined messages (up to 459 characters), and it’s obvious that Nokia Smart Messaging is supported. 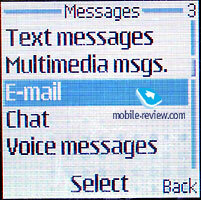 T9 can be used while typing an sms, or if you feel like chatting – use the good old Chat function. E-Mail client is installed, it can work with both protocols, POP3/SMTP. 150 sms and 50 EMS messages can be stored. Call list. 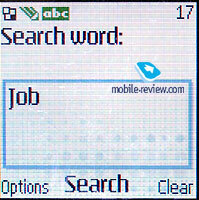 Call list consists of a traditional list of Received, Dialed and Missed calls. Each list can store up to 20 numbers. The call length and cost is shown here as well. Profiles. Nothing extraordinary in this menu, just activate the profile you want, you can also set the time for a profile to be active and personalize each of them. Settings. From here you can choose wallpaper, color schemes, list of shortcuts used for right soft-key and auto key lock. Camera. 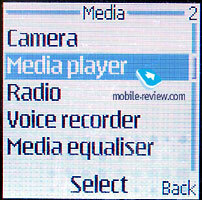 The phone has the same camera as one used in Nokia 7600 and 6650. The built-in camera allows you to take pictures in VGA resolution, and portrait mode (80x96 pixels), the pictures are stored in JPEG format. When viewing pictures on phone’s screen the quality is awful, however, after transferred to PC they are slightly better, but still not as good as expected. 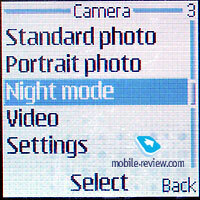 Three types of image quality are available, Night Shot mode supported. Video clips can be recorded at 15 frames per second (3GP format, 128õ96 pixels, with sound) with a maximum length of 2 and a half minutes. The quality is average and the sound is often out of sync. You can’t really make good use of this feature. It's rather a fashionable solution. Gallery. All pictures made by camera, sound files, images are stored here. You have the ability to create folders, it’s common. Organizer. 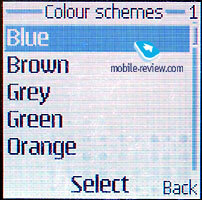 This feature is similar to one used in other Nokia phones. You can enterup to 100 to 500 entries depending on their length. Automatic deletion of old entries can be enabled. The Calendar can be viewed monthly and dates can be accessed as well. The To-Do List has option to set the deadline for each entry. 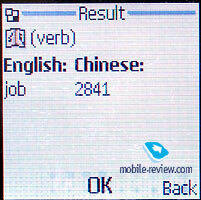 It's pretty that notes can have up to 3000 symbols each, compared with Nokia 6800. The Alarm Clock is simple, you can only set it for definite time. This menu also features program named ‘Wallet’, where you can store personal details about credit cards, passwords etc. and it requires a password to access entries. Applications. Such programs as Vocabulary (English-Chinese, Chinese-English), although, most likely it will not be in European release, unit converter and World Time are located here. 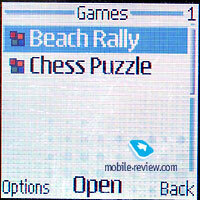 The phone has two pre-installed games Beach Rally – racing game, and Chess Puzzle – Chess. Media. 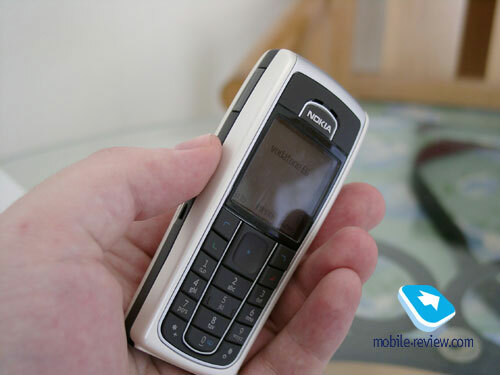 Nokia 6230 has FM-Radio, you can just listen to it, or use it as alarm for Alarm Clock (NB! Headset must be connected). 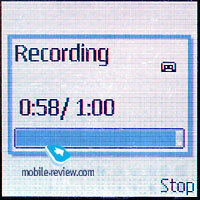 Dictaphone allows to record 3 minute length files, their quantity is not limited. Dictaphone works during stand by mode and talk. 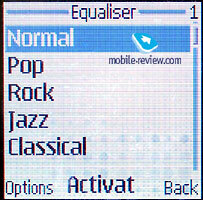 Equalizer allows to change settings for sound, it’s targeted mainly for FM radio. MP3 player is located in this menu as well. Connectivity. 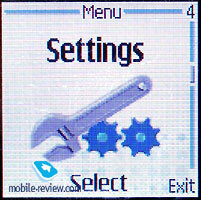 Settings for GPRS, IrDA and finally Bluetooth can be found here. Realization of bluetooth function is not bad, the phone is compatible with the most of headsets, if they have the latest firmware installed. Nokia 6230 supports EDGE (up to 236.8 Kbit/s, class 10, 4+1, 3+2), this function is not yet supported widely, so such parameter should not be the deciding factor for buying this phone. Services. A Wap browser v2.0 can be accessed from this menu. 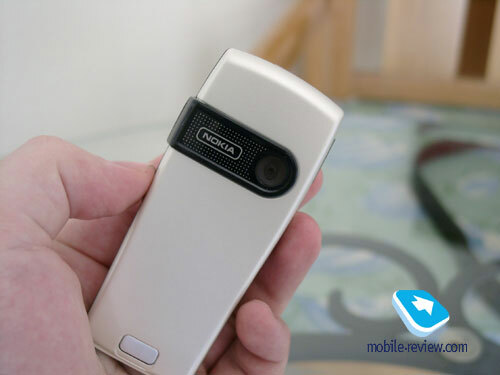 While using this model, I had to compare it with Nokia 6610 more, than with Nokia 6220. Mainly because of the design, and impressions you get during the phone’s usage. Overally, this model is not bad, it has MMC-card slot, Voice Command function and Dictaphone. 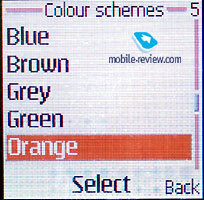 The two last features were missing in Nokia 6610, that’s why if you’re interested in them – you could choose 6230 instead. 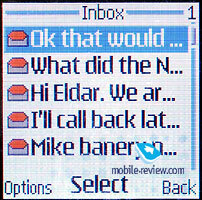 E-Mail client, large Notes, they are less important in this case, just additional pros for the phone. The phone will be released in the end of January, 2004. The price will be around 400 dollars, which is rather high for such phone. In my opinion, it should not cost more than 350-370$. A lot of people will like using this model as MP3 player, after all, it’s the first model after Siemens SL45, that has this feature. Smart phones are not taken into account. Overall, this model is well-balanced and worth your attention. 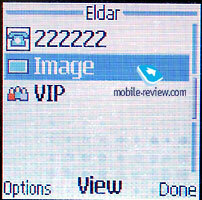 This is the first phone from the large amount of analogues that will be released starting from April 2004.